The Sorrento Sailing Couta Boat Club has received a record 165 entries for the McDougall + McConaghy 2015 International Moth World Championship due to be sailed in the popular seaside town of Sorrento on Port Phillip Bay over 9-16 January. Among the entries is defending world champion Nathan Outteridge. 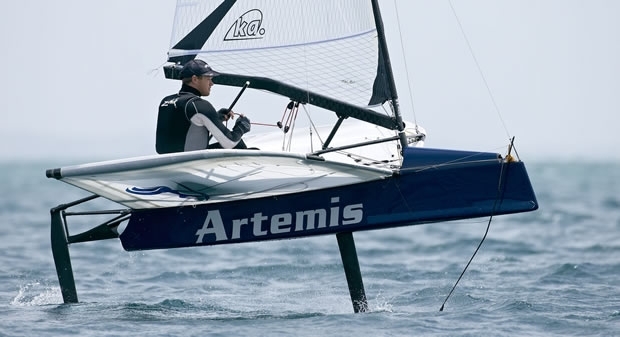 The NSW 2012 Olympic 49er gold medallist and America’s Cup helmsman for Artemis Racing will attempt to defend his title and in the process become one of the first world champions in the New Year. Outteridge is well aware those he will race against are just as credentialed. Concentrating on his 2016 Olympic 49er campaign in Rio and the Worlds in Santander, he has also been flat out in his role as skipper for Artemis Racing in San Francisco these last few months. “I actually haven't sailed my Moth at all since the 2014 Worlds in Hayling Island back in July,” said the multi-skilled sailor. “I've been watching all the videos of the Oracle boys sailing at my home club in Wangi Wangi (on the NSW Central Coast). I'm good mates with a lot of them, especially Tom Slingsby." Almost entire America’s Cup teams will be represented by Oracle Team USA, Emirates Team New Zealand and some from Artemis Racing. So it will be a double edged sword, as fellow America’s Cup and Olympic crew members go head-to-head for the title. With regards to the major threats in defending his title, “Where do I start?” Outteridge questions. “Probably Bora (Gulari, 2013) and Josh (McKnight, 2012), who have won Moth World titles before will be tough to beat. They’ve been training really hard all year. “Then there are the fulltime Moth sailors who for the past few years have populated the top ten; like Scott Babbage, Chris Rashley (GBR), Ben Paton (GBR), Dave Lister, Anthony Kotoun (USA), Rob Gough and Amac (Andrew McDougall, also co-sponsor of the Worlds). They may not be pro sailors, but they are dedicated to their Moth sailing and would love nothing more than to take the title.